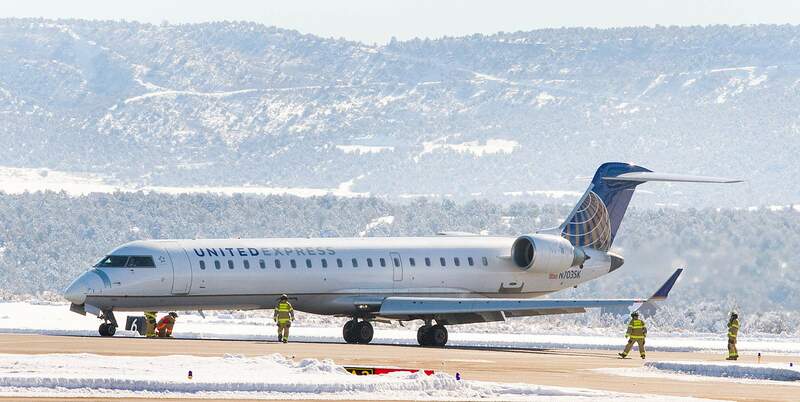 A United Airlines flight turned around shortly after takeoff Thursday morning at the Durango-La Plata County Airport because of a report of smoke inside the plane. The plane landed safety. A United Airlines flight that departed Durango en route for Denver on Thursday morning was turned around shortly after takeoff because of a report of smoke in the aircraft. Flight No. 4473 departed at 8:39 a.m. from Durango-La Plata County Airport and declared an in-flight emergency at 8:44 a.m., said Toni Vicari, director of aviation at the airport. “The report that we received was smoke in the aircraft,” he said. The smoke was reported to be in the lavatory, he said. The CRJ700 aircraft turned around and landed safely at 8:52 a.m. Firefighters at the airport inspected the plane but found no signs of active fire. The plane remained grounded as of Thursday afternoon. “We have no reports of anyone injured or aircraft damage,” Vicari said. Airport emergency staff cleared the scene at 9:23 a.m. The plane holds 70 passengers and a three-person crew; it had 71 people on board at the time.